I'm not an admirer of the harry potter books/movies/cult at all, but this masterpiece of appropriation is something all its own. If you haven't witnessed this hilarious-yet-poetic work of art, you can click on the above title for a free download ("podcast") of the feature-length mp3 audio recording. 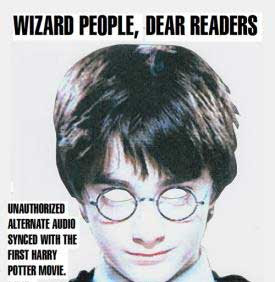 Then rent "harry potter and the sorcerer's stone" on video, turn off the dvd's sound, and play the alternate soundtrack from your computer or ipod. A far-less preferable, but more convenient, method would be to see the whole modified movie in frustrating five-minute installments on your overrated iphone.